This entry was posted on October 7, 2014 by Patrons of the Pit. It was filed under Uncategorized and was tagged with 22 1/2 inch, barbecue, barbeque, bbq, cooking, food, foodie, grilling, outdoor cooking, review, the minion method, weber, Weber smoker, weber smokey mountain, wsm. thanks for the post. i luv bbq, especially when it’s smoked. You’re welcome. Thanks for chiming in! This is so helpful! David wants one of these and I have contemplated getting him one for this Christmas. Do you really think the Egg is better? He would love it for sure. 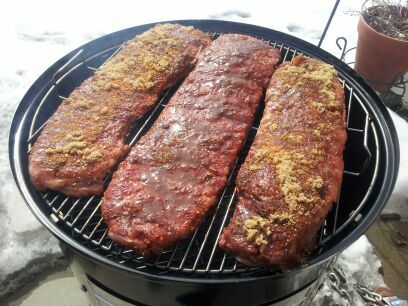 You cannot find a review from some one who bought a weber smokey mountain and didn’t love it. So, you won’t go wrong. That being said, and if your rich or something, the Big Green Eggs are even better, yes. They are sealed tighter, making for excellent combustion. They are versatile too. You can run them at 225 degrees fpr low and slow stuff, but you can also get them up to 700 degrees for them two inch thick steaks. Some day I may get one, but man, they’re pricey. Their other weakness is that if they for some reason tip over in the night, like one of your black bears there decides to sumo wrestle with it, you run a fair risk of cracking the ceramic, and that would make a pit boy quite sad. But I do recommend the WSM. It would compliment the Weber Performer you already have, and bring a great over-all versatility to your BBQ exploits on the mountain. Let us know what you get! Merry Christmas, David, in advance!!! Indeed. Yeah if you ever did get the big green egg, best get one with the built-in work bench deals too, if only to discourage your bruins from knocking it over. True, you’ll you’ll have to set up a revolving payment plan tho! 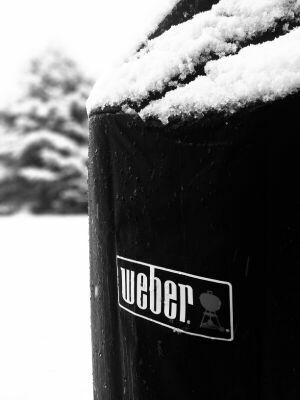 If they knock the weber smokey mountain over tho, no big deal. It ain’t going to break. Another reason for Weber right there. 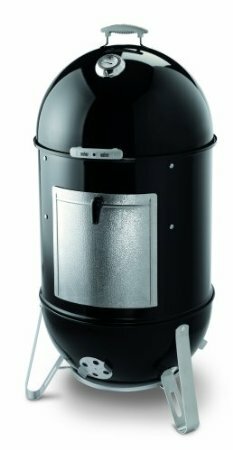 I always affectionately referred to my smoker as R2-D2…. Who after yeas of loyal service is now in need of replacing. Great post!!! Ah yes, one cannot help but to call the thing R2 from time to time. Wow,and you managed to wear one out?? Well done!! Nice, great review. Looks like C3PO. Had to laugh at your comment on the cardboard box it’s housed in, LOL, guest room for relatives, LOL!!! Well only special relatives. Thanks! Haha nice! I have enjoyed your smoking posts over there. You have the hang of things indeed! May the pork be with you also. 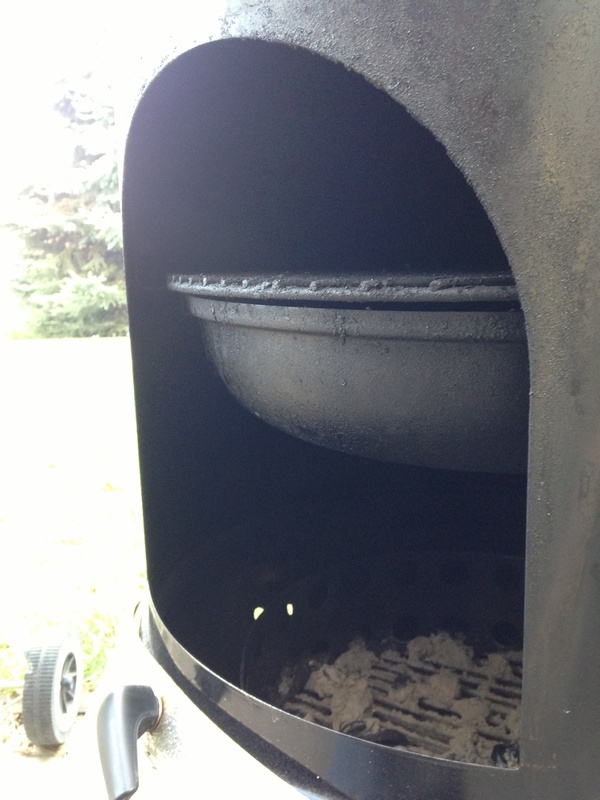 Two things that make a Weber a Weber, the enamel coating and the dome lid. The enamel coat means it won’t rust EVER. 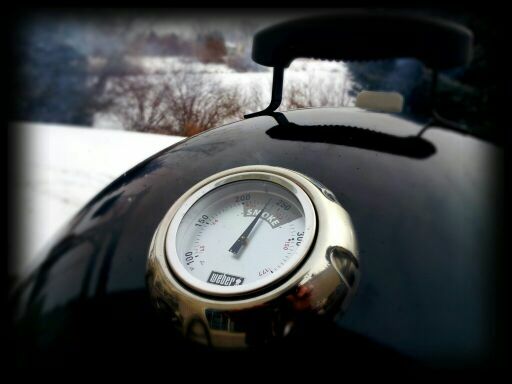 And the dome lid turns it into a convection somker, meaning that your smoke takes a couple of trips around the meat before hitting the exit ramp to the top vents. That’s right! They really are of an ingenious design. Functional and stalwart. And made in the USA no less. But yeah, the no rust thing is maybe the best thing. I’ve long enjoyed that aspect. As a man of meat, it’s the only logical evolution! Carry on smokey brother! Good to see the WSM getting a little love. I’m a proud 22.5 owner myself and couldn’t think of a better advertisement than one of your blog entries. I also bought one of those asbestos mats that I put underneath it so the concrete stays nice an clean. Oh – and I’ve been putting an Aluminum pan on the lower grate to catch the drippings and use them in sauces and other such things… And the water pan stays clean. Cheers guys. Thanks Mr Quincho. Some good little tricks you mention there. I had never heard of the mat underneath. Cool idea. The pan idea is great, then you don’t have to dart about the yard carrying that water pan full of muck whilst figuring out what to do with it. No kidding! That’s pretty cool. Yes the old water pan can look akin to a petri dish if you don’t get to it soon. Pretty crude looking stuff. Leave it to Dragnfli to sprinkle the aromatics of a little rosemary in it, and there by tame it down a tad. Nice! Appreciate you taking the time to chime in. Thank you kindly! Awesome. I’ve been water smoking for nearly thirty years. 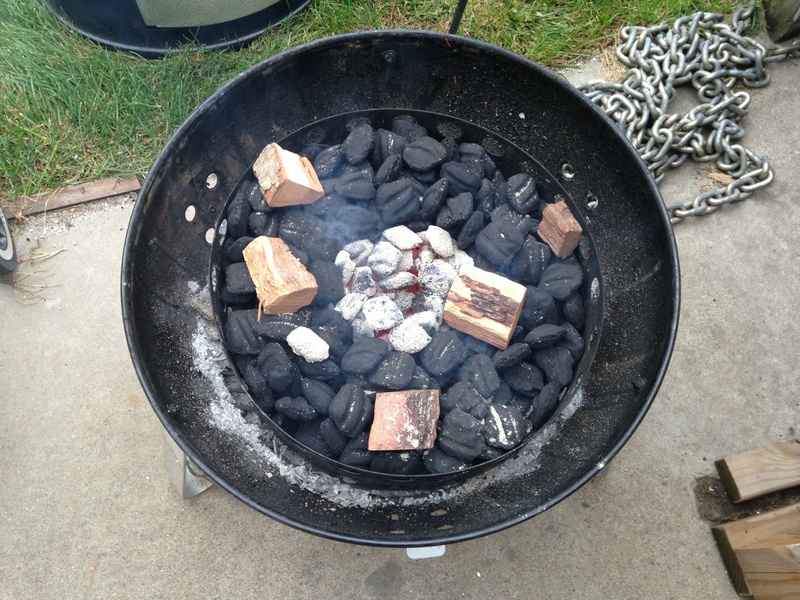 By far my favorite way to cook meat. I’m glad Weber stepped into the fray. It looks like they have done a great job. Thanks for sharing. Agreed, old boy. The world is a better place indeed with water smokers in them, no doubt. So good! I own a 22 1/2″… Love, love, love it! Like wise. A fine pit for the money. Solid. Stalwart. Good of you to drop by old boy. Been a while! A long while indeed.